Sound was only part of the experience, though. 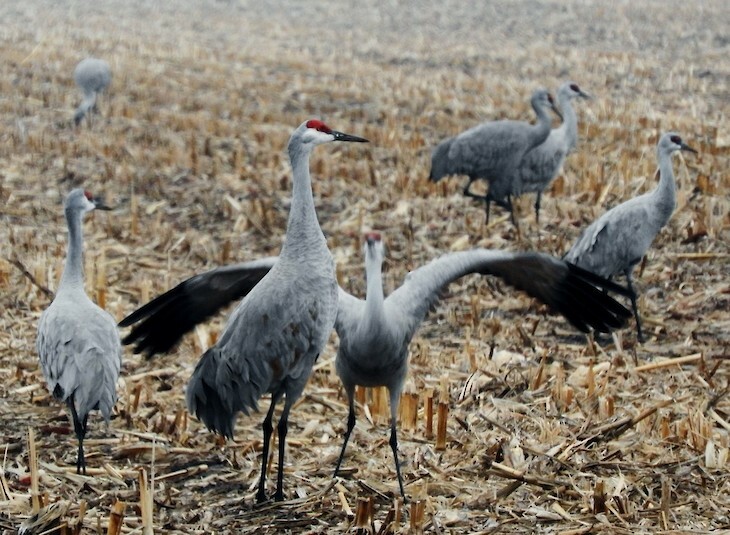 The soft gray bodies of cranes stretched as far across the stubbly cornfield as I could see. Farm equipment, irrigation sprinklers, and homesteads provided backdrops that faded in and out of the mist. 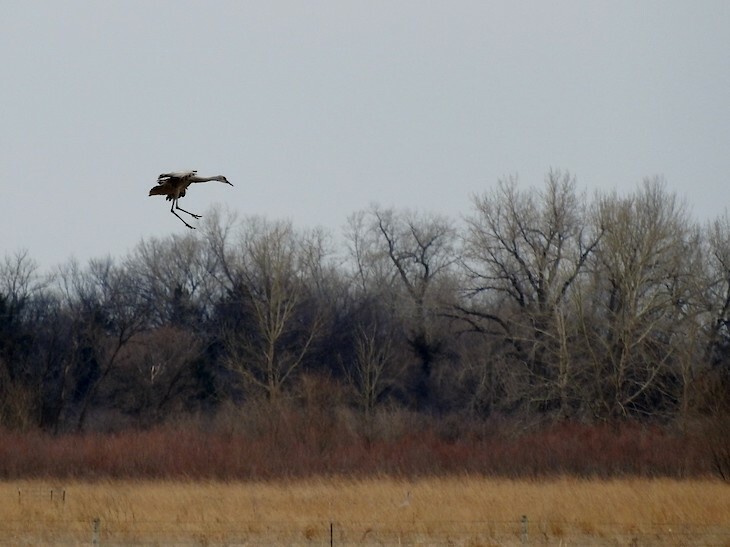 Every spring, over 500,000 sandhill cranes descend on the Platte River of central Nebraska. 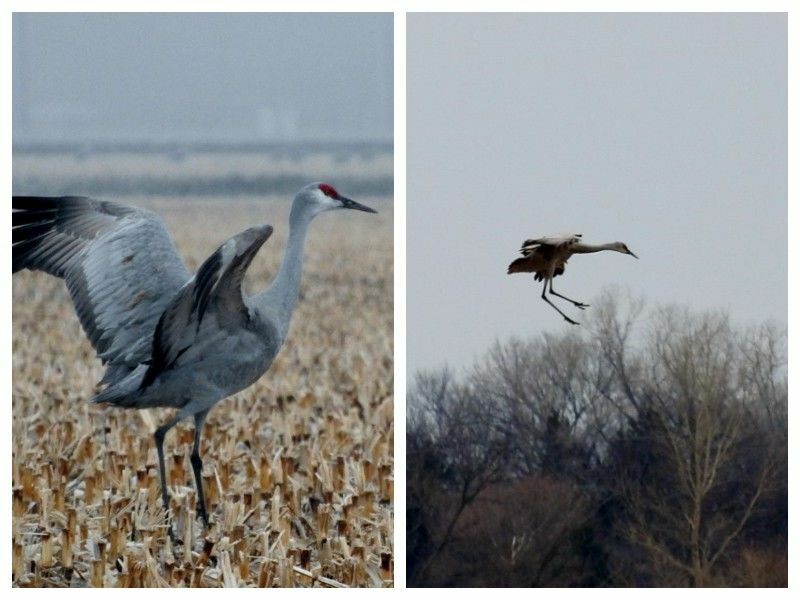 The agricultural landscape of the Great Plains may be derided by coastal humans as “flyover country,” but to the cranes, it is just the opposite. The shallow river and its gravel bars provide safety for nighttime roosting. Nearby farm fields hold feasts of waste grain, and surrounding wetlands provide additional food and habitat. Like a flock of Mary Poppins, the sandhill cranes arched up their wings and parachuted down with leggy landing gear outstretched. Photo by Emily Stone. On their long migration from wintering grounds in northern Mexico, Texas, and New Mexico to their summer breeding habitat in the northern U.S., Canada, and even Siberia, sandhill cranes spend a very important month near the Platte River. Here they can put on an additional 10-20% of their bodyweight: fuel for the final leg of their journey. As my friend Jamie and I poked our cameras out of the car windows, we were a little frustrated at how focused the birds were on eating. Heads down in the corn stubble, their fluffy gray rumps were cute, but not terribly photogenic. We could empathize, though. This crane-watching stop was just the halfway refueling point on our own, longer journey. The sunbathed slickrock of southeast Utah beckoned, but with evening descending, we also needed to find some dinner and a safe place to roost. The cranes find safety in numbers. In any group, at least a couple sentinels stood with their red-capped heads upright and alert for danger. I was surprised to notice that cranes near the roadsides turned and stalked inward as my little station wagon rolled by calmly. Cars often make pretty good blinds for birdwatching, and surely these birds were used to traffic on the country roads that dissect so much of their habitat. But while cranes are protected in Nebraska and Wisconsin, they are hunted in Minnesota, Kansas, South Dakota, and several other states. It’s good that they are skittish around humans. At first I was frustrated that simply driving by would interrupt their feeding and cause them to move farther out of the range of my zoom. Once the cranes became agitated and stopped feeding, though, a few of them started dancing. Sometimes called “ambivalent behavior,” it’s a way to release nervous energy when the danger isn’t serious enough to cause flight. Sandhill cranes sometimes dance just to release nervous energy, but dancing is also an integral part of their pair bonding and mating ritual. Photo by Emily Stone. Lifting great black-fingered wings, they flapped, bowed low to grab some scrap, and leaped straight up while tossing leaves, stalks, or corncobs into the air. Their pointed toes and slim legs emulated the grace of a ballet. I’m sure a true courtship dance would be even more spectacular. The trumpeting unison calls of mated pairs would add to the intensity. The tango of two is essential to pair bonding, readying their hormones for mating, and even dissipating aggression between rivals. Parents dance with their colts to help them learn, and young cranes practice dancing for three years before they mate. The sporadic dancing halted as a farmer on a four-wheeler sped off down a field. In great waves, wings opened and carried the birds aloft. They trumpeted and circled. The breadth of their reach, the urgency of their calls connected us to ancient rituals. Cranes are often confused with great blue herons. But while herons fly with their neck in an S, cranes leave both legs and necks outstretched. Photo by Emily Stone. 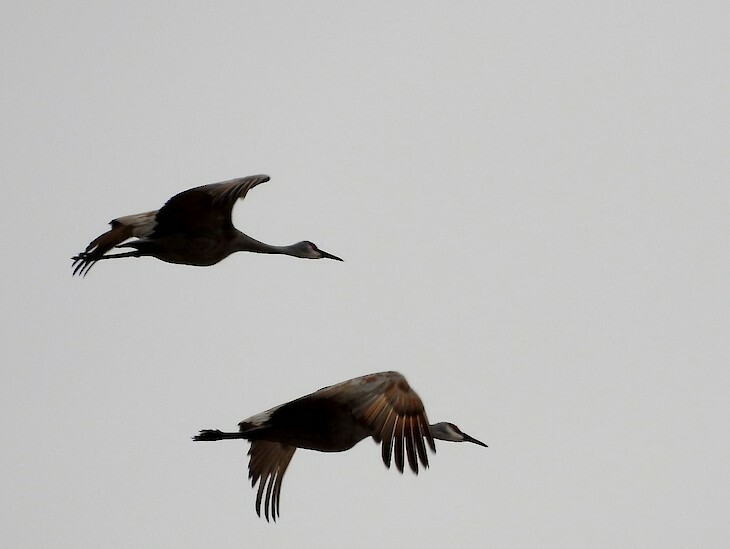 As the four-wheeler disappeared around a corner, though, a silent group of the circling cranes began to descend. Like a flock of Mary Poppins, they arched up their wings and calmly parachuted down with leggy landing gear outstretched. Sometimes, flyover country is the perfect place to land. Emily’s second book, Natural Connections: Dreaming of an Elfin Skimmer, is now available to purchase at www.cablemuseum.org/books and will soon be available at your local independent bookstore, too. For 50 years, the Cable Natural History Museum has served to connect you to the Northwoods. Come visit us in Cable, WI! Our new Curiosity Center kids’ exhibit will open May 4.